This is “Keynote Speaking”, section 18.3 from the book Public Speaking: Practice and Ethics (v. 1.0). For details on it (including licensing), click here. Understand the purpose of keynote speeches in society. Explain the basic objective of an after-dinner speech. Describe the purpose and types of motivational speeches. The last type of entertaining speech we will examine is the keynote speech. A keynote speechSpeech delivered to set the underlying tone and summarize the core message of an event. is delivered to set the underlying tone and summarize the core message of an event. Keynotes are often given at the end of an event; there can also be a number of keynote speeches delivered throughout a longer event that lasts for several days. People who deliver keynote speeches are typically experts in a given area who are invited to speak at a conference, convention, banquet, meeting, or other kind of event for the purpose of setting a specific tone for the occasion. Some keynote speakers will actually work for a speakers bureauAgency that represents celebrity and professional speakers., an agency that represents celebrity and professional speakers. One very important organization for all aspiring keynote speakers is the National Speaker’s Association (NSA, http://www.nsaspeaker.org). NSA also publishes a widely respected magazine for professional speakers called Speaker magazine, which can be accessed for free from their website (http://www.nsaspeaker-magazine.org). In the world of professional public speaking, there are two common types of keynotes: after-dinner speeches and motivational speeches. Let’s look at each of these unique speeches. After-dinner speakingSpeech that is informative or persuasive but also designed to elicit laughter from one’s audience. gets its name from the idea that these speeches historically followed a meal of some kind. After-dinner speakers are generally asked to speak (or hired to speak) because they have the ability both to speak effectively and to make people laugh. First and foremost, after-dinner speeches are speeches and not stand-up comedy routines. All the basic conventions of public speaking previously discussed in this text apply to after-dinner speeches, but the overarching goal of these speeches is to be entertaining and to create an atmosphere of amusement. After-dinner speaking is probably the hardest type of speaking to do well because it is an entertaining speech that depends on the successful delivery of humor. People train for years to develop comic timingThe verbal and nonverbal delivery that someone uses to enhance the comedic value of a message., or the verbal and nonverbal delivery used to enhance the comedic value of a message. But after-dinner speaking is difficult, not impossible. Here is the method we recommend for developing a successful after-dinner speech. First, use all that you have learned about informative or persuasive speeches to prepare a real informative or persuasive speech roughly two-thirds the length of what the final speech will become. That is, if you’re going to be giving a ten-minute speech, then your “real” informative or persuasive speech should be six or seven minutes in length. Next, go back through the speech and look for opportunities to insert humorous remarks. Table 18.1 "Forms of Verbal Humor" lists various forms of verbal humor that are often used in the textual portion of a speech. Aside They are otherwise known as oxymorons, which are not people who don’t know how to use acne medication. Colostomy, wasn’t he one of the Greek Gods? Spoiled rotten, or what happens to kids after spending just ten minutes with their grandparents. Malapropism He’s a vast suppository of information (suppository should be repository). This is bound to create dysentery in the ranks (dysentery should be dissent). Self-Effacing Humor I looked over at my clock and it said 7:30, and I had to be at work by 8:00. I got up, got dressed, and sped to the office. Only then did I realize that it was 7:30 p.m. and not 7:30 a.m.
Word Combination with Unusual Visual Effects That kid was about as useful as a football bat. He was finer than frog hair. Each of these is a possible humor device that could be implemented in a speech. Read the following speech delivered by Mark Twain on his seventieth birthday for a good example of an after-dinner speech (http://etext.lib.virginia.edu/railton/onstage/70bday.html). Once you’ve looked through your speech, examining places for verbal humor, think about any physical humor or props that would enhance your speech. Physical humor is great if you can pull it off without being self-conscious. One of the biggest mistakes any humorist makes is to become too aware of what his or her body is doing because it’s then harder to be free and funny. As for props, after-dinner speakers have been known to use everything from oversize inflatable baseball bats to rubber clown noses. The goal for a funny prop is that it adds to the humor of the speech without distracting from its message. Last, and probably most important, try the humor out on real, live people. This is important for three reasons. First, the success of humor depends heavily on delivery, and especially timing in delivery. You will need practice to polish your delivery so that your humor comes across. If you can’t make it through one of your jokes without cracking up, you will need to either incorporate the self-crackup into your delivery or forgo using that joke. Second, just because you find something unbelievably funny in your head doesn’t mean that it will make anyone else laugh. Often, humor that we have written down on paper just doesn’t translate when orally presented. You may have a humorous story that you love reading on paper, but find that it just seems to drone on once you start telling it out loud. Furthermore, remember there is a difference between written and verbal language, and this also translates to how humor is interpreted. Third, you need to make sure the humor you choose will be appropriate for a specific audience. What one audience finds funny another may find offensive. Humor is the double-edged sword of public speaking. On one side, it is an amazing and powerful speaking tool, but on the other side, few things will alienate an audience more than offensive humor. If you’re ever uncertain about whether a piece of humor will offend your audience, don’t use it. Personalize or localize humor when possible. Be clear about which words need emphasis with verbal humor. Be sure the punch line is at the end. Don’t let on where the joke is going. Don’t try to use humor that you don’t know well. Don’t use humor that you personally don’t find funny. Don’t apologize if others don’t laugh. Don’t try to explain the humor if it fails—just move on. Don’t drag it out! Remember, brevity is the soul of wit. Know when to stop joking and be serious. Be natural and have fun! The second common form of keynote speaking is motivational speaking. A motivational speechSpeech designed not only to make an audience experience an emotional arousal (fear, sadness, joy, excitement) but also to motivate the audience to do something with that arousal. is designed not only to make an audience experience emotional arousal (fear, sadness, joy, excitement) but also to motivate the audience to do something with that emotional arousal. Whereas a traditional persuasive speech may want listeners to purchase product X or agree with ideology Y, a motivational speech helps to inspire people in a broader fashion, often without a clearly articulated end result in mind. As such, motivational speaking is a highly specialized form of persuasive speaking commonly delivered in schools, businesses, religious, and club or group contexts. The Toastmasters International Guide to Successful Speaking lists four types of motivational speeches: hero, survivor, religious, and success.Slutsky, J., & Aun, M. (1997). The Toastmasters International® guide to successful speaking: Overcoming your fears, winning over your audience, building your business & career. Chicago, IL: Dearborn Financial Publishing. The hero speechType of motivational speech given by someone who is considered a hero in society (e.g., military leader, political figure, professional athlete). is a motivational speech given by someone who is considered a hero in society (e.g., military speakers, political figures, and professional athletes). Just type “motivational speech” into YouTube and you’ll find many motivational speeches given by individuals who can be considered heroes or role models. The following clip presents a speech by Steve Sax, a former major league baseball player. The survivor speechType of motivational speech given by someone who has survived a personal tragedy or has faced and overcome serious adversity. is a speech given by someone who has survived a personal tragedy or who has faced and overcome serious adversity. In the following clip, cancer survivor Becky M. Olsen discusses her life as a cancer survivor. Becky Olsen goes all over the country talking with and motivating cancer survivors to beat the odds. The religious speechType of motivational speech designed to incorporate religious ideals into a motivational package to inspire an audience into thinking about or changing aspects of their religious lives. is fairly self-explanatory; it is designed to incorporate religious ideals into a motivational package to inspire an audience into thinking about or changing aspects of their religious lives. One highly sought-after religious speaker in the United States is Joel Osteen, head minister at Lakewood Church in Houston, Texas. In this clip, Joel is talking about finding and retaining joy in life. The crux of Osteen’s speech is learning how to take responsibility of one’s own life and let others take responsibility for their lives. The final type of motivational speech is the success speechType of motivational speech given by someone who has succeeded in some aspect of life and is giving back by telling others how they can be successful too., which is given by someone who has succeeded in some aspect of life and is giving back by telling others how they too can be successful. In the following clip the then CEO of Xerox, Anne Mulcahy, speaks before a group of students at Dartmouth College discussing the spirit of entrepreneurship. In this speech, Mulcahy shares the leadership lessons she had learned as the CEO of Xerox. 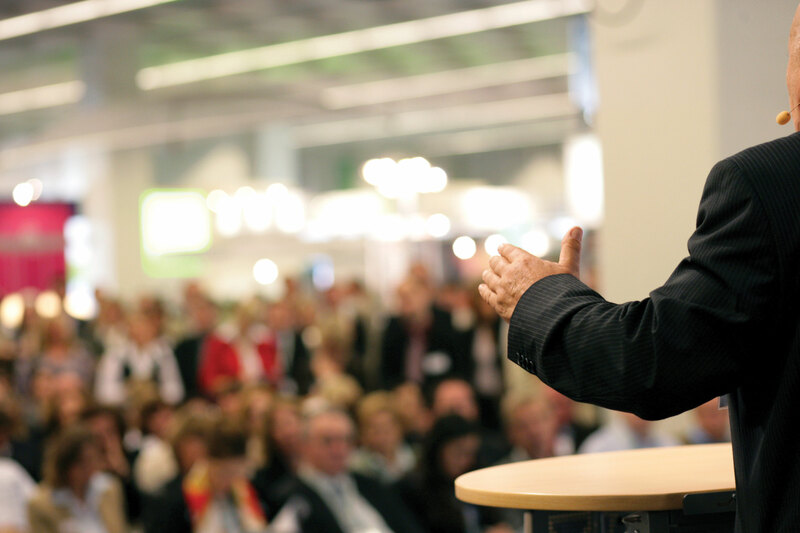 Keynote speeches are delivered to set the underlying tone and summarize the core message of an event. After-dinner speeches are real informative or persuasive speeches with a secondary objective of making the audience laugh. Effective after-dinner speakers must first know how to effectively write a speech and then find appropriate humor to add to the presentation. Motivational speeches are designed not only to make an audience experience emotional arousal (fear, sadness, joy, excitement) but also to ask the audience to do something with that emotional arousal. There are four types of motivational speeches: the hero, the survivor, the religious, and the success. Take one of the speeches you’ve delivered in class and think of ways to add humor to it. Ultimately, you’ll turn your original speech in to an after-dinner speech. Think about your own life. If you were asked to give a motivational speech, which type of motivational speaker would you be: hero, survivor, religious, or success? What would the specific purpose of your speech be?